Carolina Shores Resort, nestled on the North Carolina / South Carolina border between Calabash, N.C. and Little River, S.C. is the �best kept secret in the area� according to Frances Porter of Starheel Properties of Calabash. There are 126 condominiums in the resort that was built in 1984. Of that number there are 42 with one bedroom and one bath and 84 two bedroom and two bath units. Both styles of units have ample floor space with the two bedroom units measuring over 1,050 sq. ft.
One of the best attributes of the resort is the location. The resort is perfect for any number of people who might decide to locate there. It is situated perfectly for the longterm resident who may work only a short commute to Little River, North Myrtle Beach, or Myrtle Beach, not to mention those who work in the charming village of Calabash, N.C. And Carolina Shores Resort is just minutes away from all of the South Brunswick County beaches such as Sunset, Ocean Isle and Holden. Just to the north of the resort are Shallotte, South Port, and Wilmington. 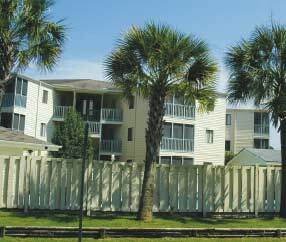 Most enduring about Carolina Shores Resort is what it offers to those who live or visit there. Local attractions include the beaches, golf, dining, fishing, shopping, and plenty of local history and charm, as well as many other possibilities. Many residents love the numerous local golf courses in the area including nearby Carolina Shores. In addition to the world-class golf, one can enjoy any number of fishing opportunities � from the local piers and beaches to offshore excursions for the serious fisherman. There are also plenty of shopping opportunities from the charming, small shops of Calabash and the local beaches to the malls and stores of Myrtle Beach. Myrtle Beach also offers any number of activities from water and amusement parks to clubs and theaters. After a wonderful day at the beach, the links, shopping or fishing the area offers a wide variety of restaurants. Most famous is the seafood of Calabash, but almost any variety, style, and atmosphere of dining can be found nearby. After dinner, the area offers as wide a variety of nighttime activities as can be found anywhere.